Paying tuition isn’t exactly what most people are referring when they say that college will be the best four years of your life. The good news for Rhode Island residents is that, due to state, federal, and private financial offerings, you may not have to finance your education alone. Rhode Island, various New England organizations, and the federal government provide scholarships and grants for you to apply for, and we’ll show you how to locate funds from local and private organizations as well. To begin, let’s take a look at the four steps all Rhode Islanders should take towards funding a college education. The first step in your financial aid search is to complete FAFSA. This stands for Free Application for Federal Student Aid, and it is the standard form used by college-bound students across the nation. We’ll admit, completing the FAFSA is not fun. It’s generally a pretty long form, which is why we’ve created a handy guide to walk you through the process. You may be tempted to rush through the FAFSA, but it’s best to take the time to answer each question correctly in order to get the most financial aid possible. Now that you’ve completed the FAFSA, you can apply for additional aid directly from your state. The Rhode Island Department of Education (RIDE) administers some scholarships and grants specifically for Rhode Island residents, and acts as a state coordinator for certain federal scholarships, as well. The United States Senate Youth Program (USSYP) for current high school juniors and seniors enrolled who want to pursue degrees in public service. To qualify, students must be an elected leader of an eligible student organization, participate in Washington Week, and enroll at a participating United States college or university within two years of high school graduation. Presidential Scholars is for Rhode Island high school students demonstrating strength in leadership and involvement in their school and community, as recognized by their specific high school. Rhode Island high schools are encouraged to nominate one male and one female student to the Presidential Scholars Commission, which will then select a maximum of twenty nominees to be considered for the award. Presidential Scholars in Career & Technical Education for outstanding Rhode Island students who demonstrate success in career and technical education, as recognized by their specific school or center. Five nominees will be selected to receive the award. Paul Sherlock Scholarship for financially needy Rhode Island residents with an expected family contribution (EFC) of $12,800 or less. Rhode Island Promise Scholarship for Rhode Island high school graduates pursuing an associate’s degree at the Community College of Rhode Island (CCRI) or a bachelor’s degree at Rhode Island College or University of Rhode Island. The scholarship provides free tuition at CCRI, or two years of free tuition at one of the four-year institutions. Rhode Island Supplemental Grant is a need-based grant for Rhode Island residents who are enrolled at least part-time at a participating institution. Additionally, Rhode Island residents may be eligible for Tuition Break, a scholarship program offered by the New England Board of Higher Education. Tuition Break charges regional tuition rates, rather than out-of-state tuition rates, for students enrolling or transferring into a bachelor’s program at an eligible New England institution. You should also apply for scholarships and grants from local or private organizations, as well. You can learn about these opportunities by conducting some internet searches of your own. Rhode Island residents can locate financial aid money by searching on websites such as CollegeScholarships.com, or by using a portal created by the Rhode Island Student Loan Authority. The Rhode Island Foundation is a non-profit organization that manages over 150 scholarships and fellowship programs for Rhode Islanders. You can view their offerings, submit a scholarship questionnaire, and check back for upcoming deadlines here. Additionally, the Community College of Rhode Island offers over 90 scholarships for students enrolling in their institution. If you’re in high school, schedule a visit with your high school guidance counselor to discuss local scholarship awards. Your guidance counselor may be more helpful than you think, and could direct you to a great opportunity you hadn’t known existed. Army Scholarship Foundation, which awards one-year financial scholarships to students who are children of current or former Army service members or spouses of current Army service members. You can read about additional scholarship and grant opportunities on the websites of Rhode Island College, University of Rhode Island, and the Community College of Rhode Island. If you have completed steps one through three and still need college funds, it may help to take out a private loan towards your education. This is another form of financial aid that may be able to provide the missing dollars you need to finance your education. 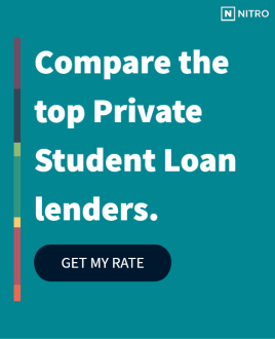 Before taking out just any Rhode Island private loan, you can check out our free NitroScore tool to discover what size of loan you need. The tool is pretty simple to use. You will be prompted to enter your intended college and major into the boxes provided, and the tool will generate your total costs, salary after graduation, and potential loans needed. From there, NitroScore will tell you how easy your loans will be to repay based on your projected salary. It can help to enter additional info about personal scholarships, grants, and savings to compare different college/major combinations, and explore the best possible scenarios for your future education. Resources exists to fund your education. Check them out, and get started with your financial aid journey today.